More than 1,000 kids seized a three-block business district in a student neighborhood near the University of California at Santa Barbara wednesday night, Feb. 25, held it from police for six hours, smashed windows, set fire to a police car, and burned a plush Bank of America office to the ground doing more than a quarter of a million dollars damage to the bank alone. Five hundred national guardsmen were called out Friday, Feb. 27, and another 2,500 placed on standby alert after students drove 300 police out of their neighborhood three nights in a row. Two inches of rain plus a student decision not to fight the Guard quieted the area Friday and Saturday nights. We don’t have any quarrel with them, a spokesman said. But sheriff’s officers worried that renewed demonstrations would follow the pull-out of the Guard on Sunday and Monday. It scares me, said Sheriff Lieut. William Chickering. We’ve been told that the demonstrators are going to wait until the National Guard pulls out and do it to us again. A total of 141 persons were arrested In five nights. At least 34 policemen were injured. Other casualties Included a 35 year-old university employee, who was shot in the shoulder when he accidentally drove through a police roadblock, and a 21-year-old student, who was hospitalized after being run down by a police car thursday night. Gov. Ronald Reagan flew to Santa Barbara on Thursday morning. He called the demonstrators cowardly little bums, declared a state of extreme emergency, and placed National Guard units on alert. He also said he would declare martial law if necessary. County officials ordered a 6 p.m. to 6 a.m. curfew, and police were ordered to prohibit loitering on public streets and to break up assemblies of more than three persons. Students defied the orders, and a combined force of 300 police, California Highway Patrolmen and sheriffs deputies was gathered from three counties Thursday night. They fought students for six hours and were forced to withdraw at 11:30 p.m. The most spectacular destruction occurred Wednesday night. One thousand demonstrators began pelting sheriff’s cars with rocks. At 9:45 p.m. they captured one car, forcing two deputies to flee and then setting the car afire. The flames were 30 feet high. 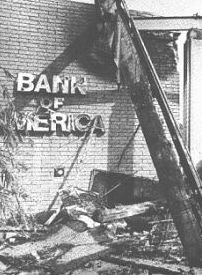 Windows were smashed; the plywood used to board up the Bank of America’s windows, smashed the day before, was torn down and set afire; demonstrators then surged into the bank. An observer said that the group inside hurled chairs into windows, overturned desks, created snowfalls of envelopes from an upstairs office and tore up anything they could reach. Then some people got a big trashcan, set it on fire, and ran it through the front doors and pushed it against the drappery. The police were informed that a manager was inside the burning bank. Seventy sheriff’s deputies, in full riot gear, were sent to free the manager, but when they arrived they found they had fallen into a trap. There was no manager inside but there were hundreds of students surrounding the cops, throwing rocks. The police fought their way out and withdrew completely, surrendering the area to the students until 2:15 a.m., when a force of 240 cops returned to clear the streets. After the police withdrawal, firemen were unable to reach the bank. Some fraternity members tried to put out the fire, but it was ignited again and the whole place was gone in 45 minutes. Afew charred beams were all that remained the next morning, bank officials said $275,000 damage was done. One veteran radical said, While the students heId the shopping center, there wasn’t an atmosphere of ‘wild in the streets.’ The group was calm and highly political –explicitly anti-capitaltst. Targets of window-breaking were chosen carefully: the Bank, the real estate offices which gouge students on rents, and the gas stations whose companies pollute Santa Barbara Bay with oil seepages. Small businesses were not touched. The business district that was seized and held from police on three consecutive nights lies in the heart of Isla Vista, a suburb of Santa Barbara, with a population of 13,000. Of these, 9,000 are students of the University of California branch here. The students had been united by a series of on-campus demonstrations which began in January, when Bill Allen, a popular anthropology professor, was denied tenure. Three-fourths of the school’s 14,000 students took part in one demonstration or another. Two-thirds of the student body signed a petition in support of Allen. This was the first time radical politics made an appearance at the University of California at Santa Barbara, one veteran radical said. In the campus demonstrations there was a feeling of the early sixties –they were non-violent and not confrontation demonstrations. In spite of the peaceful character of the campus demonstrations, police arrested 19 people, dragging many of them out of bed in the middle of the night. The demand to re-hire Allen was not met and a massive residue of frustration and hostility to the police was left. The Chicago conspiracy defendants became immensely popular among Santa Barbara students. Tom Hayden gave a speech at the University in early January, drawing an enthusiastic crowd of 1,200, the largest audience ever assembled fora political event on the campus up to that time. In February, the official student government invited Defense Attorney William Kunstler to speak on campus, offering him $2,000 of student funds, plus a percentage of the gate, plus a passing of the hat. He appeared Wednesday afternoon, February 25, in the football stadium, where 7,000 people paid 50 cents each to hear him. The night after his speech the bank was burned. Gov. Reagan suggested that Kunstler had violated the Rap Brown act – saying he crossed a state line to incite violence (this is the law the Chicago defendants were convicted under). Student leaders pleaded with newsmen not to say Kunstler incited the violence, pointing out that the windows of the bank had been broken the night before his appearance on campus. The Bank of America, whose offices have been attacked during the past week in Berkeley, San Francisco and Los Angeles, has offered a $25,000 reward for the Santa Barbara arsonists. Board Chairman Louis B. Lundborg reported that we have not been able to open the vault doors since the fire, but we assume that the bank’s funds and records are safe. He said the bank was proud to be a symbol of the establishment in the real sense of that word: established law and order, established orderly process. I was in Isla Vista the day after the bank was burned down. I talked to many students about the riot and found that the riot had nothing to do with the war in Viet Nam (or little). The night before in the news they claimed it was anti war. . The riot was protesting the high prices of rents being asked of students in the Isla Vista area which was spurred on by the realtors in the area and the bank of America’s high interest rates. This is why they hit the bank with gallon wine bottles filled with gas and attacked the realtors. It was very well coordinated. I knew people directly involved and they said it was a festive atmosphere as they tore sprinklers from UCSB sprinkler system out of the ground to use as weapons.. It is rumored that the police officer that was shot was actually shot by a CIA plant who was used in the media to give credit and a black eye to the riot as an anti war protest movement. This was a lie. It was amazing seeing the aftermath and seeing what a few students could do when organized. Of course at that time the war permeated everything and was on the minds of all of us youths that might have to go to Viet Nam… I was 18 at the time,. And was going to Cuesta College in San Luis Obispo,. But had friends in Isla Vista from Atascadero California.. .I was visiting an older man who worked in that area and he had no problem paying his rent, although compared to Atascadero prices it was indeed high..
At that time I was against the war and supportive of many strange things that now seem silly. This was one of those things it was wanton destruction of private property and a whole block was actually decimated. Although I had no love for the bank of America it is always obvious who will end up paying for such actions, the very people that did them. I came upon this article looking up the SDS and the riots in Berkeley. In Berkeley blocks of stores on Shattuck Boulevard had their windows shattered and had plywood where the windows should have been. Once again it seemed a waste of energy and was counter productive to any possible agenda that might have been imagined. It was simply anarchy for anarchies sake. Even then in my heart I did not approve of such actions and I.V. (as it was called) was especially ridiculous, because they were simply fighting against a system that many of those same people sold out to later. . . I, Ronald Schalla, had a most interesting perspective. I was an NCO in the California National guard headquarters unit of the 144th Artillary, 40th Disivion of the 6th Army stationed in Santa Barbara. Because of our close proximity, the 144th was the first unit deployed in Isla Vista after burning of the Bank of America (BOA). A curfew was in effect and the only thing open after curfew was the sub shop the Yellow Submarine, which was kept open using personnel from our unit in civilian clothing. A few brave hungry students went there to buy subs to eat and were promptly taken into custody by uniformed soldiers from our unit. As senior NCO and trainer for use of riot control dispersing equipment for the 40th division along with Victor Giglio and Bill Ballard, we were responsible for guarding the prisoners given into our custody. We were told by the officer to guard the 3 prisoners assigned to us and if they tried to escape, we were ordered to shot to kill with our M-16 rifles. All three of us agreed that we would not shoot anyone, it was absurd to think that we would do that. But there would be two more times in subsequent potential deployments that we were given orders to kill American civilians by officers of the 144th. Again, the officers telling us this, we considered incompetent. Our unit got along too well with the people of Isla Vista. We were greeted as liberators. Obviously no conflict there, so they pulled us out, and brought in military police units from LA area including one fellow I had been in basic training with at Fort Ord, who filled me in on what they were doing. I was in the National Guard and not on active duty full time. I was also working for Pacific Material Testing laboratory in Goleta. a few weeks after the BOA burning, the president of the company Doral Neely sent me to the BOA site to do an assessment of the damage from the fire for the insurance company to determine if anything was salvageable, in particular the vault. Oh by the way at this time I had been trained and schooled as a deputy inspector of reinforced concrete and masonry for the County of Los Angeles for more than three years. During my inspection I was surprised at the extent of the damage to the vault. The concrete in the vault ceiling and to a lesser extent the vault walls had exploded leaving two mats of number 8 deformed reinforcing bar (rebar) was exposed in the 2 to 3 foot diameter craters in the ceiling of the vault. The thick stainless steel vault door was so warped from the heat that the door could not be opened. There was nothing left to salvage, I reported to Doral Neely. A coworker Bill Barker (I think that was his last name) told me that he had been there at the Bank burning. Along he did not participate in the burning, I asked him how did they get the fire so hot that the concrete exploded leaving craters and the giant vault door 12 inches thick looked like the incredible hulk had punched it several times. He said that it seemed to be well orchestrated because trucks drove up with containers of gasoline and diesel that were put in the building and set off. I think most of the students at the time were more upset about other issues in the community and not really anything to do with the Vietnam War. Vic, Bill and I were called up again when the high tech computer system building on the UCSB campus was taken over. It was to be our job to go in and drive the occupiers out with chemical agents, but the action was cancelled when we explained that CS is composed of super fine particulates and not a gas, and would probably permanently damage the computer systems. I lived on Del Playa in I.V. during the riot, and worked at Devereux on an internship from Wilmington College. I lived in SB then I was 19 and why did they shoot an innocent student ?? where is that in the reports ??????????????????? I was living in IV during the riots also. I lived in the apts on the corner of Abrego Rd and Del Playa and was there at the riots, man o man wasn’t that sumpthin??? Also I was kind of an indirect witness to the people who commited the sleeping bad murders behind UCSB July 4th 1970, remember that?